The Spring Offensive on our stretch of the Parkland Walk (Tunnel to Tunnel), was highly effective at the time [see Feb post below], but nature is fighting back and the Japanese knotweed is now as high as an elephant’s tusk. Our leader, Dawn Miles, has therefore arranged another digging and slashing party for Saturday 14th June. Meet at the Muswell Hill tunnel at 1pm with gloves, wellies and maybe a spade or fork. 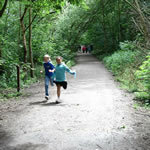 All Parkland Walk users welcome, including our sturdy mini-marathon runners (above). We just need an hour of your time. Put it in your diary now. For those of you who would like to know more about the flora and fauna of the Parkland Walk and to explore the southern section, down to Stroud Green, an educational walk has been organised for this Sunday 1 June setting off from the Holmesdale Rd entrance (just south of Highgate u/g) at 2pm. Yes, at 1pm on Saturday 9 February 2008 the Friends of Parkland Walk turned out in good numbers (10) and high spirits to clear the litter from the Parkland Walk, particularly from the Hill end by the tunnel. "How jocund did they drive their team afield" as the poet Gray elegised. They left it looking pretty good and were rewarded by the Council’s using up some unspent Making a Difference money (cleverly negotiated by Dawn Miles) to run wire mesh netting along the bottom of the fence [as in the picture]. 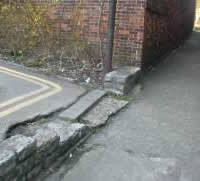 The hope is that this will stop litter blowing on to the Walk from the Hill. Ha! 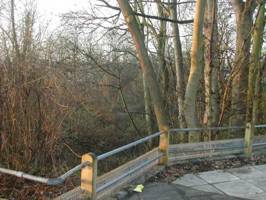 At 1pm on Saturday 9 February 2008 the Friends of Parkland Walk (a group of Hillfield Park environmentalists like you!) 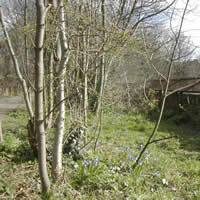 will be meeting, rain or shine, to tidy up our section of the Parkland Walk after the winter. The work will be mostly rubbish collection and moving fallen timber away from the viaduct (where it tends to be used for ad hoc bonfires). Gloves and wellies are recommended. Children would be very welcome. You don’t have to stay all afternoon: 30 minutes work would be greatly appreciated. Martin, Alison and Peter put in some sturdy work on the Parkland Walk on 6 October 2007 and did such a good job on the Japanese knotweed (that old friend) that an ecologist who studied the Walk subsequently could find no trace of its presence. Don’t worry, it’ll be back! There will be public consultation on the proposals at the end of January 2008 and Hillfield Parkers will have a chance to comment then. If all goes well work will start in the autumn. You can make an extra point of verbiage here on the LibDem's petition site, as mentioned in last week's Ham & High, 31st May'07 on page 5 : "MP seeks your view on future of Parkland."